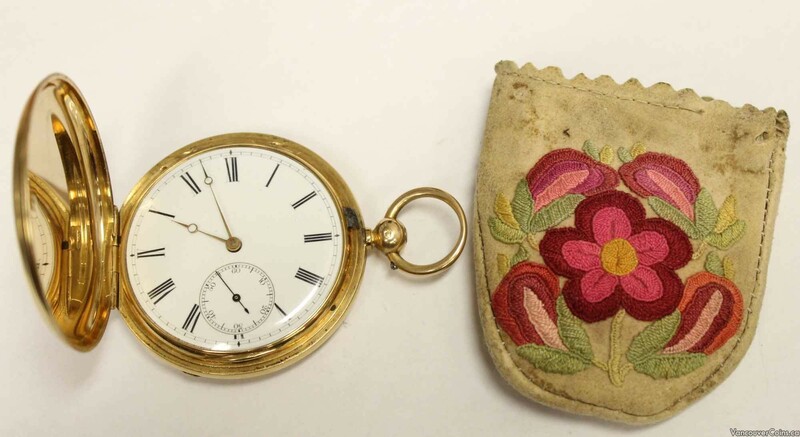 Important 18K Solid Gold Pocket Watch Metis pouch C:1875 J.Bartleman HBC - Professional Dealers of Coins, Bank Notes and Bullion. Inherited from his father with the same given and surname, John Bartleman treasured this 1875 18k solid gold watch. The hand embroidered Metis deer skin pouch obtained by him c: 1911 protected this valuable historic timepiece which served Bartleman throughout his tenure with the Hudson’s Bay Company, from 1913 to 1950. Bracebridge's, Clerkenwell, London: An 18k solid gold hunter, fusee pocket watch, circa: 1875. Almost mint condition white enamel dial, no hairlines, or other damage, with black Roman numerals, & subsidiary seconds. Outer front cover is plain, no engraving. This Fusee “chain drive” watch is in excellent working order, is all original, and grades 9+ overall out of 10. An important HBC historical artifact with excellent appreciation potential. Position mouse over image for larger view. John Bartleman’s Gold Watch Bracebridge's, Clerkenwell, London: An 18k solid gold hunter, fusee pocket watch, circa: 1875.